I just realized after typing it that "the pink stool" sounds disgusting, but bottom line is we just painted a stool. Pink. 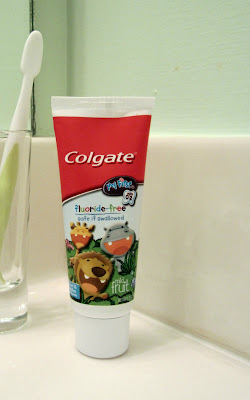 Since Madison has 7 teeth now, she's all about brushing them and since we certainly want to promote good hygiene, we're willing to do whatever we can to assist. Starting with flavored toothpaste that she immediately became obsessed with. 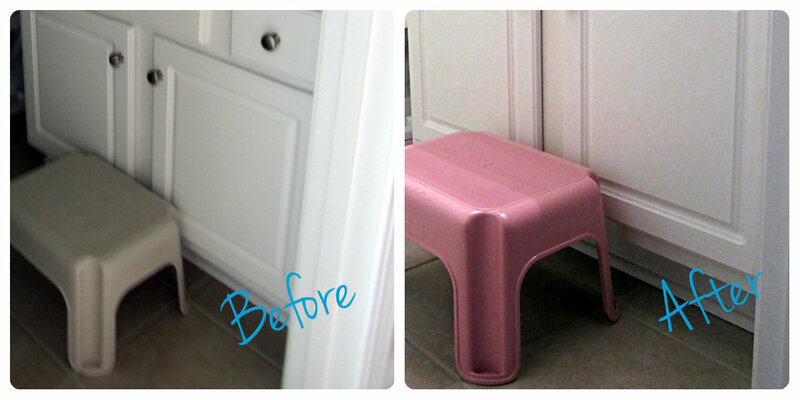 I took the stool outside and placed it on my paint station (i.e. cardboard that I cut from a diaper box) and set up shop to turn this pitiful puppy into a pink pedestal fit for a tooth brushing princess. I also purchased a can of spray primer to use first in hopes it would make everything come together faster and easier. 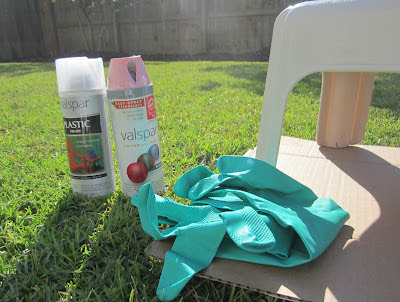 Allison suggested I use some gloves we had on hand so I wouldn't get spray paint fingers. 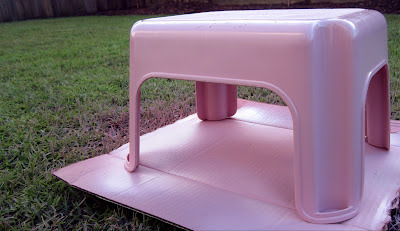 I sprayed a coat of primer on both the bottom and the top then waited an hour as the directions suggested. Personally, I'm proud of myself for following directions. I'm impatient and that hour felt like forever as I was ready to be D-O-N-E with this stool. So fast forward an hour and I applied the first coat of the pink on both the bottom and top then I waited 5-10 minutes as advised between coats. Ultimately, I gave her three coats total. Pepto-Bismol wasn't the name of the color, but it should have been. I wasn't sold on it and neither was the Mrs. yet we decided to put it in Madison's bathroom for the time being until we find something we like better. It serves the basic function of helping her get in the habit of cleaning those cute little teeth of hers. 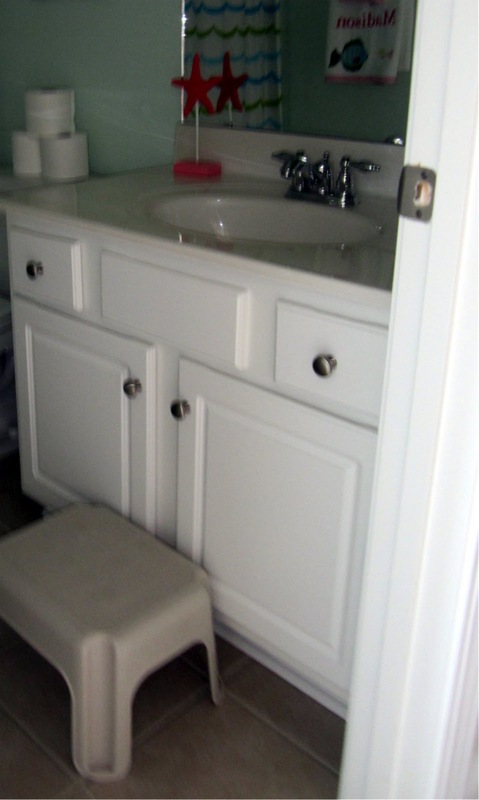 Once in her bathroom, it didn't look so heartburn-nausea-indigestion-upset stomach-diarrhea-pink. 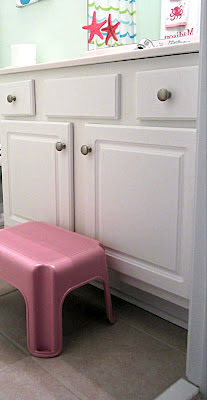 There you have it... the pink stool. We also put slip resistant tabs on the bottom of the feet so we don't have any panic attack inducing accidents.